"Positive Combat Die Rolls" are the words of wisdom from champion Chris Withers. Chris won his fourth straight GC2 championship this year. The focus of the 2003 tournament was on the Battle of Chancellorsville, celebrating the 140th anniversary of the battle. Thus most of the scenarios were taken from Stonewall's Last Battle with a handful of scenarios from the Peninsula Campaign and On to Richmond. 18 players took to the battlefield, and we had three newcomers attend the training session. The preliminary rounds heavily favored the Union. In nine playings of Salem Church (SLB#1) for round #1, the US was undefeated and in six playings of Great Flank March (SLB#2) for round #2, there was only one US loss. This trend continued in round #3 with three US victories and only one loss in Seven Pines (OTR#4). However, the CSA cavalry reigned supreme at Brandy Station (SLB#4) in round #4 with five victories and no losses. The final preliminary round was Gaines Mill (OTR from Skirmisher #1) which split the two games played. The Quarterfinals were played using Sedgewick to the Rescue (SLB#3), basically the combination of Salem Church and Great Flank March. It was split with two US and two CS victories. Advancing to the semi-finals were Chris Withers, Ed Beach, Ken Lee, and Mark Booth. The Semi-finals were played using Seven Pines (OTR#4), repeated from the other day. In a reversal of the results, the CSA won both games, thus the total for Seven Pines was three US and three CS victories. Advancing to the finals were Chris and Ed. The scenario chosen for the Final was Certain Destruction Awaits (SLB#5). Ed stated that this was the very first scenario he designed. He was the Union and Chris the Confederates. The first turn was rain which inhibited early movement although US cavalry headed for the exit edge. Day 2 and the Union started pushing Anderson away from Tabernacle Church. Jackson however repulsed the attack and the Union set up a strong defensive line in front of Chancellorsville. Meanwhile, several Union cavalry units went raiding off the map. Day 3 saw Jackson go on a rampage. A string of CSA initiatives and favorable combat results and the Union line crumbled. Although the Union moved forward at Fredericksburg, the heavy losses sustained (19 US to 1 CS) was deemed to be insurmountable and Ed conceded at the end of day 3. 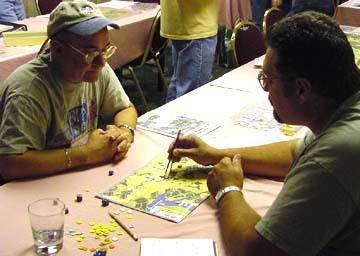 While the elimination rounds were ongoing, Paul Nied and Joe Doughan moved out of the Washington defenses and in the Shenandoah Valley to attack Dave Cross, Charles Ellsworth, and Ken Lee in a playtest of 1st Bull Run designed by Mike Belles and Chris Withers. Johnston moved down the Valley to attack and drive back Patterson, however, McDowell was left with a significant numerical advantage enabling him to cut Beauregard's supply line. The battle was stopped at that point late in the afternoon and extensive notes were taken and forwarded to the developers. The playing was enjoyed by all and we look forward to the actual publication of the scenario.